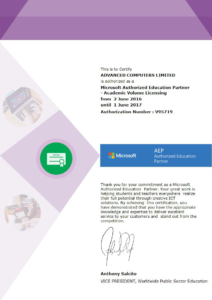 Result IT is now a Microsoft authorised education reseller. This means we can get software into schools for cheaper than ever. 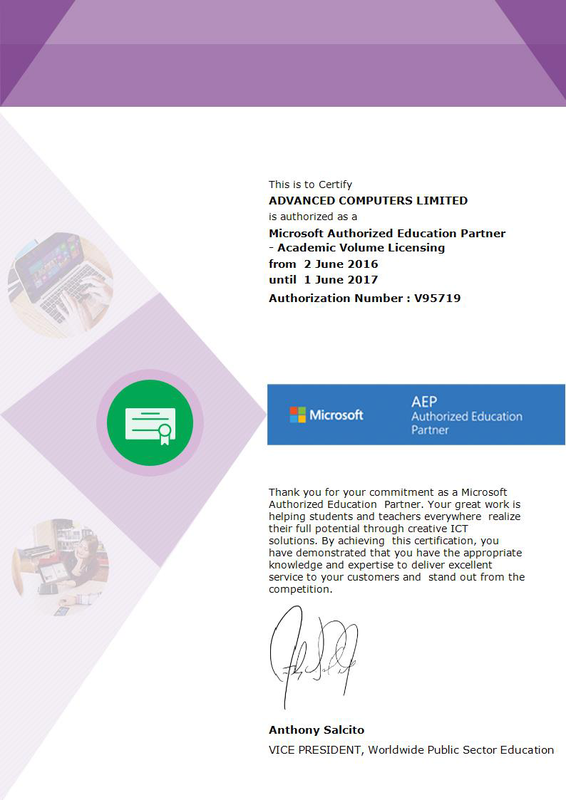 The Microsoft Authorized Education Partner (AEP) programme allows us to sell products to qualified educational users for prices which allow academic institutions large discounts and ensure licensing is legal. When forming a relationship with an academic institution, we deliver resources and tools to keep the school, university or other learning institute informed. We deliver up to date information on new products and events as well as technical support. The massive savings on software and licences available benefit students and allow schools to spend where it’s essential. For example, a recent quotation done for a qualified educational institute allowed them to save over $5,000. For your academic quote please contact Nancy Zhang on 029 4448823 or 5261800. Result IT's certificate from Microsoft's Authorized Education Partner network.